Sorry for being away for a while suddenly, I’ve had burn-out. I had been pushing too hard for too long, and after a sudden rush of illnesses in May, I had to slam the brakes and heed my mama’s orders to stay with her for a week while my dad went on the motorbike trip I was meant to go on with him, my uncle and a family friend. So, on mama’s orders, I went to stay with her for a week. This entry was posted in Blogs and tagged burn-out, cooking, how to recover from burn-out, how to stop burn-out on 22/06/2014 by catherine. 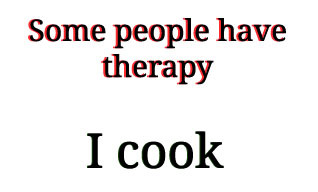 This post isn’t going to be about cooking. This post is going to be about you. Specifically, I’m asking you all to take care of yourselves. (although those are great things to have (make mine a vanilla full-fat latte with cinnamon lightly dusted on top please)). (although I do confess that drinking 2l of water with other drinks like tea, soda and coffee as “extra” each day instead of the other way around, is the single change that has made me feel healthier above everything else). I’m talking about doing the things that make you feel alive – at least once a week. This entry was posted in Blogs and tagged coming alive, cooking, cooking as therapy, self-care on 18/07/2013 by catherine.